"And the second angel poured out his vial upon the sea; and it became as the blood of a dead man: and every living soul died in the sea. And the third angel poured out his vial upon the rivers and fountains of waters; and they became blood. And I heard the angel of the waters say, Thou art righteous, O Lord, which art, and wast, and shalt be, because thou has judged thus. For they have shed the blood of saints and prophets..."
Surveying all the prophecies of the Holy Bible, we might well conclude that one of the most startling of all prophecies is the horrifying image of a Sea of Blood. Throughout the 20th century mankind experienced savage atrocities and bloodshed on a breathtakingly brutal magnitude. Reviewing the ages of man, we see that there have, of course, always been massacres and genocide. But, the 20th century stands out because of the growth of the totalitarian nature of governments. True, in past eras, we had our Alexander the Greats, our Genghis Khans, and our Attila the Hun types who killed and rampaged with impunity. But, with the explosion of the ideological "isms"—fascism, communism, socialism, nazism, zionism—and the rise of Big Brother tools, concentration camps and gulags, the butchery and black evil of genocide and mass killings seemed to take a quantum leap. Worse, the 20th century may prove to be a harbinger of even greater bloodshed and horror to come in the 21st century. Interestingly, the mass media has focused most all its attention on just one great genocide and massacre: The Nazi holocaust. Ask the average person to describe the carnage and holocausts of Armenia, Rwanda, Nigeria, Cambodia, Red China, or Soviet Russia and you will receive a blank stare. Due to media brainwashing, as far as the public is concerned, there has only been one holocaust, one genocide—that of the Nazi Germans who, we are reminded over and over, singled out the Jews for victimhood. For years, I have poured over thousands of books and papers to ascertain the truth about genocides and holocausts throughout human history, during the 20th century and prior. Few people have done as much research and investigation on these monstrous events. In so doing, I have been able, with God's help, to gain a clear understanding of what really happened during the centuries after Christ when the Romans put hundreds of thousands of Christians to death. I know of the intrigue surrounding the Inquisition, of the murderous intentions of the Illuminati who massacred thousands in the bloody French Revolution, of the horrors and crimes of the men who invented the Soviet Gulags, and of the countless dead bodies stacked into pyramids of bones by the Khmer Rouge of Cambodia. In 1915, Masonic Jewish socialists overthrew the Islamic Ottoman government of Turkey and commenced the genocidal murder of two million Christian Armenians. "Butcher Brigades" of criminals cut off so many hands of Christian victims, the British Consul reported, that, if placed side-by-side, a highway could have been built of severed human hands. 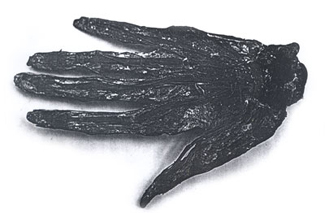 This severed hand of a Christian Armenian woman slain in the massacre was dried and kept as a souvenir and talisman by a Jewish Mason in the town of Salonika. My most shocking discovery is this: That the greatest murderers of all times were not the Romans, nor the French revolutionaries. No, it was not even the Red Chinese Maoists or the Nazi overlords who were the most bloodthirsty. In fact, it is undisputed that the greatest murderers of all time have been Zionist Jews. I know. You have never heard such a thing before. So what? That is simply proof that one cannot trust the establishment media to tell us the whole truth. Nor can we believe in the falsification of history foisted on us by establishment historians and scholars—men and women who have sold their souls for a bacteria-infested bowl of porridge. The past is truly a prelude to tomorrow's events. The prophetic scriptures warn us that a sea of blood is revealed in our future. Genocide is a continuing project of evildoers. What we must realize is that one particular group has clearly been designated as the next to be butchered. That group is made up of all those who refuse to pledge allegiance to the fledgling Zionist New World Order, as well as those who get in the way of its march to fulfillment. Across the globe, the symbolic snake of Zionism has slowly and inexorably worked its way across the continents of earth, conquering and gorging on spoils. The snake was made fat with the blood of Armenian Christians in 1915. The snake gorged itself with Russian, Ukrainian, and Polish blood in the 1920s, 30s, 40s, and 50s, with Lenin, Trotsky, Stalin, Beria, and Khruschev over-seeing the dismemberment of victims. Innocent German men, women, and children were devoured beginning in 1945 in gulags ruled by Jewish Commissars like Solomon Morel. In Cambodia, Pol Pot and other Jewish-trained agents of Paris' Grand Orient Masonic Lodge stacked corpses up like cordwood. All-in-all, Masonic Jews, often pretending to be Russian, Polish, Turkish, and other nationalities, massacred well over 100 million innocents. And that is only in one century. Today, the all-seeing eyed snake, led by Zionist masters, has dual headquarters in the United States/Europe and in Israel. Some 18 million Jews are on this planet. Most are more loyal to Israel and to the global "Jewish Nation" than they are to the country in which they reside. Only a few of them are actively assisting the global Illuminati conspiracy. Most have little or no knowledge of the conspiracy, but because most Jews continually "feed," encourage, and support the goals of the Zionist elite and promote Israel's brutal imperialistic ambitions, almost all Jews are complicit—that is, are guilty. Because most Jews boastfully tout themselves as a superior race, "God's Chosen," rulers and judges of earth, they must share the blame, excepting the few who have repented. The evil and poisonous doctrine of Jewish supremacy has infected almost all the Jews on earth. It causes many Jews to be arrogant and hateful. 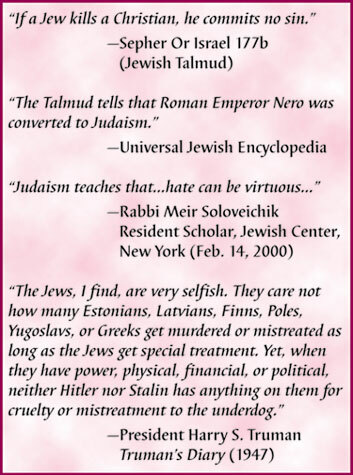 After all, their most holy religious book, The Talmud, instructs them that even the best of Christians should be killed and that the goyim (gentiles) are but cattle, slaves destined to serve Jewish masters. This religious doctrine is a recipe for satanic mayhem and destruction. Through secret societies and their many evil organizations—the Jerusalem government, the ACLU, the ADL, the B'nai B'rith, the American Jewish Committee, People for the American Way, etc.—the majority of Jews have incited, encouraged, and sanctioned the commission of grievous crimes against humanity and against God. These worldwide Jews are helping the few at the top to fill up the sea with blood. As Zionists, their aim is to rule over mankind. Sadly, what the majority of Jews cannot understand, because they are carnal and have not the spirit of Christ in their hearts, is that they will, themselves, someday become victims of their own avarice, greed, and racial pride. Pride goeth before a fall, and that fall is surely coming. Throughout the centuries, Zionists Jews have butchered and killed Christians. The Bible says they have "shed the blood of saints and prophets" (Matthew 23:27-39 Revelation 18:23-24). God surely will not allow this situation to continue. Still, it is not our task as Christians to get revenge on the Jews no matter how vile and criminal they are in their conduct and behavior toward us. "Vengeance is mine, saith the Lord." What, Then, Must Christians Do? Every Christian who reads this—and I define a Christian as only those who insist that Jesus alone is the way, the truth, and the life—needs to educate himself on the past genocidal crimes of the Jewish Zionists. Unless you understand that over 100 million Christians have already been massacred by the Zionist Jewish leadership in the past, you will not understand that their evil leadership plan targets you and me to become victims in the near future. That is why this month I offer a vital, 3-part Audiobook series on this topic, A Sea of Blood (available on Tape or CD). Obtain and listen to the voluminous evidence I present in A Sea of Blood, and I guarantee, you will understand not only what has happened, but more important, what is coming. "The thing that hath been, it is that which shall be; and that which is done is that which shall be done: and there is no new thing under the sun." "And when he had opened the fifth seal, I saw under the altar the souls of them that were slain for the word of God, and for the testimony which they held: And they cried with a loud voice, saying, How long, O Lord, holy and true, dost thou not judge and avenge our blood on them that dwell on the earth? And white robes were given unto every one of them...that they should rest yet for a little season, until their fellowservants also and their brethren, that should be killed as they were, should be fulfilled."